In science class, children learn that planets orbit the sun. 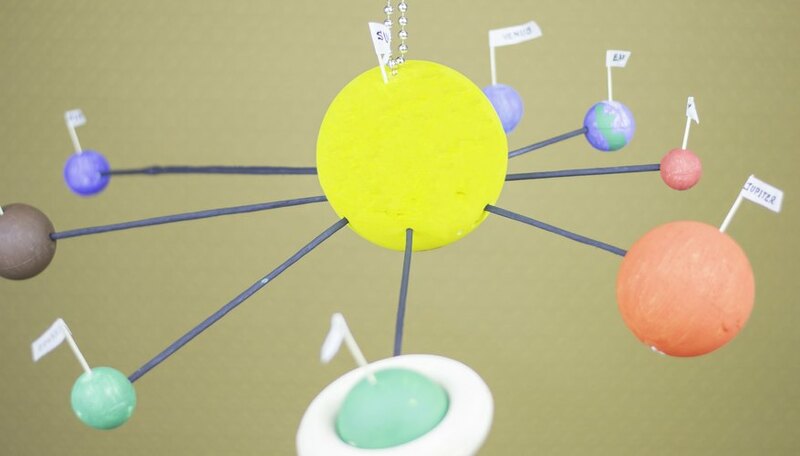 Building a model of the solar system, including the sun, eight planets and Pluto, reinforces this concept and provides children with a hands-on approach to learning the names and sequence of the planets. 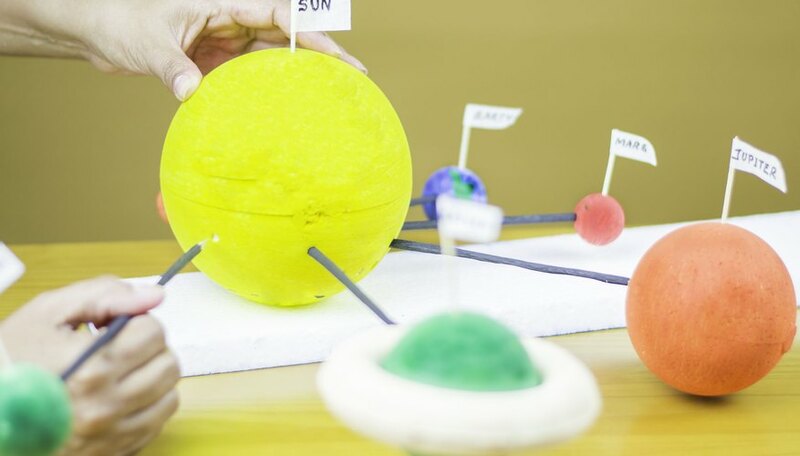 Depending on the age of the students, a model of the solar system can be detailed and accurate or simple to illustrate relative distances of the planets from the sun. For added interest, teachers can invoke the scene from the movie "E.T." in which E.T. 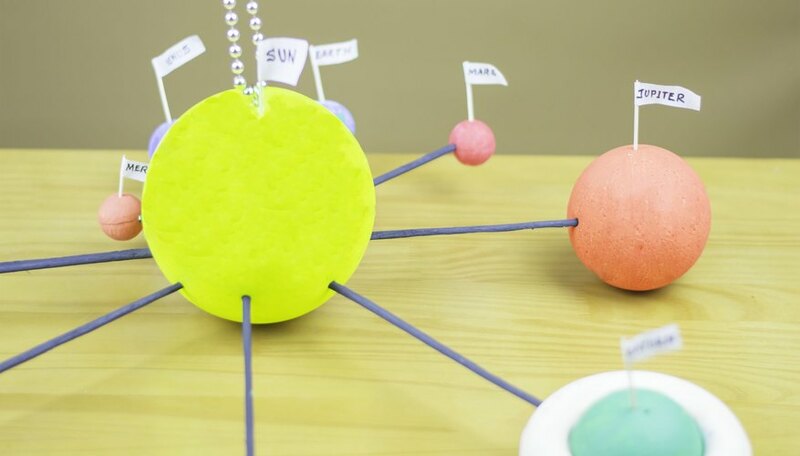 made a model of the solar system. Write "Sun" and the name of each planet on a strip of masking tape, then set it set aside. 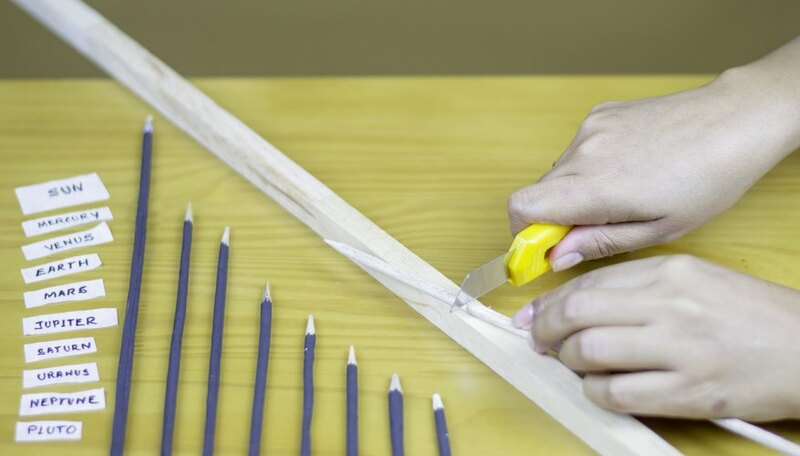 Cut nine bamboo skewers in the following lengths: 2.5 inches, 4 inches, 5 inches, 6 inches, 7 inches, 8 inches,10 inches,11.5 inches and 14 inches. Lay them in order of their lengths for easy identification. 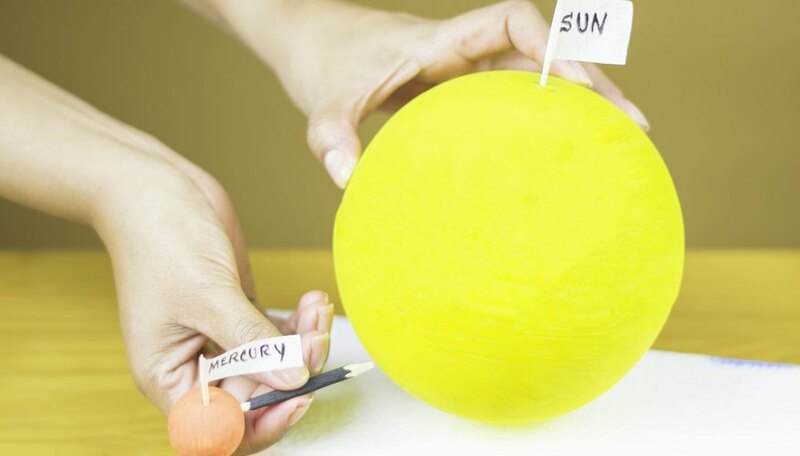 Affix the labeled strip marked "Sun" to the largest plastic foam ball and a labeled strip to each of the smaller balls to identify the planets. If desired, paint each ball and let dry before attaching a label. Insert the 2.5-inch skewer into the ball marked "Sun." Gently attach the ball marked "Mercury" into the free end of the skewer. Insert the next-longest skewer into the sun, and attach the ball marked "Venus" into the other end. Insert the third skewer into the sun, and attach the "Earth" ball to the other end. Repeat the process outlined in Step 4 for each skewer, keeping the proper planetary order: Mars, Jupiter, Saturn, Uranus, Neptune and Pluto. Secure string to the center ball (the sun) to hang, if desired. 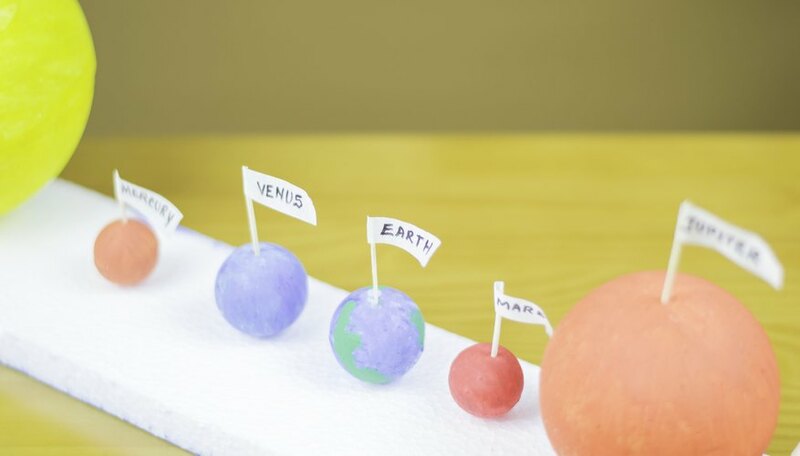 Consider using different-size balls for each planet to give better perspective: Mercury (1 inch), Venus and Earth (1.5 inches each), Mars and Pluto (1.25 inches each), Neptune (2 inches), Uranus (2.5 inches), Saturn (3 inches) and Jupiter (4 inches). Cut rings from construction paper and glue around Saturn. Draw a line around the center of the sun to form an equatorial guide for evenly spacing the dowels for each planet. Edwards, Regina. 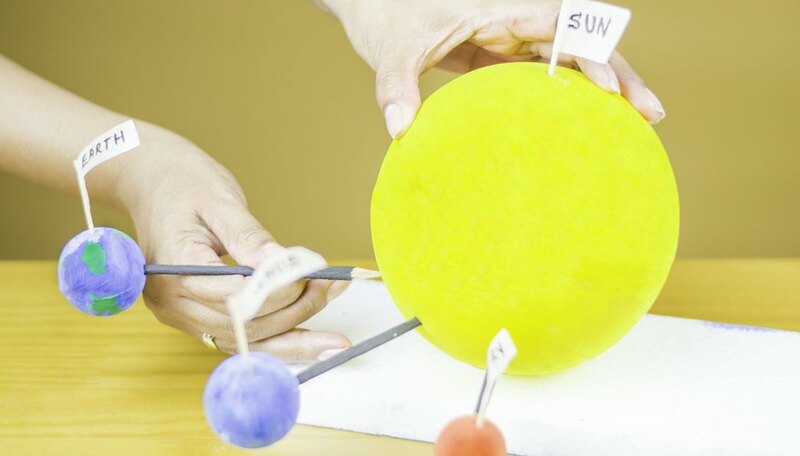 "How to Make a Model of the Solar System." Sciencing, https://sciencing.com/make-model-solar-system-5382914.html. 24 April 2017.